WASHINGTON, DC, November 9, 2012 (ENS) – The U.S. government is taking aim at wildlife trafficking in a new, more focused manner by placing it high on the foreign policy and security agenda. Increasingly run by well-funded, heavily armed criminal syndicates, wildlife trafficking “has become more organized, more lucrative, more widespread, and more dangerous than ever before,” Secretary of State Hillary Clinton warned Thursday. At a high-level meeting titled “Wildlife Trafficking and Conservation: A Call to Action” at the State Department, Clinton identified a new U.S. strategy for addressing the global problem of wildlife trafficking. It includes outreach to government leaders and the general public, a global system of regional wildlife enforcement networks and an intelligence assessment of the impact wildlife trafficking has on U.S. security interests. “This is a global issue, and it calls, therefore, for a concerted global response,” Clinton told the foreign ambassadors and leaders from international organizations, conservation groups and the private sector. “Local communities are becoming terrified. Local leaders are telling their national leaders that they can lose control of large swaths of territory to these criminal gangs. Where criminal gangs can come and go at their total discretion, we know that begins to provide safe havens for other sorts of threats to people and governments,” Clinton warned. 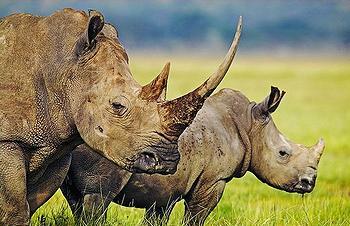 Wildlife trafficking threatens protected and endangered species, pushing some to extinction. The illegal trade in wildlife products such as ivory, rhino horn, shark fins and turtle shell is estimated to total between US$7 billion and $10 billion annually. Wildlife trafficking threatens security and the rule of law, undermines conservation efforts, robs local communities of their economic base, and contributes to the emergence and spread of disease. 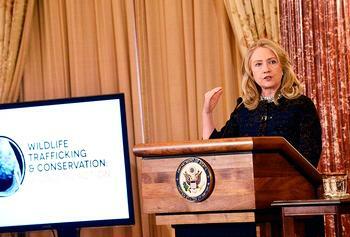 Clinton acknowledged that the United States is the second-largest destination market for illegally trafficked wildlife in the world. “That is something we are going to address,” she promised. Kenyan Ambassador to the United States Elkanah Odembo and Indonesian Ambassador to the United States Dr. Dino Patti Djalal outlined the critical situations their countries face from the violence of wildlife trafficking. Foreign Minister Phandu Skelemani of Botswana spoke via videotape, and participants viewed presentations by WildAid, the International Fund for Animal Welfare, and the Convention on International Trade in Endangered Species. Next week, Clinton said she and President Barack Obama will “personally bring this message” to government leaders in the Association of Southeast Asian Nations, ASEAN, and at the East Asia Summit when they meet in Phnom Penh, Cambodia. Secretary Clinton identified a four-part U.S. strategy for addressing the global problem of wildlife trafficking. First, the United States is working with leaders from around the world to develop a global consensus on wildlife protection. Second, the State Department is spearheading a global outreach campaign on wildlife trafficking, to launch December 4 on Wildlife Conservation Day. Third, Secretary Clinton called for a global system of regional wildlife enforcement networks, pledging $100,000 and building on the more than $24 million that USAID has already committed to the effort over the past five years to combat wildlife trade. Secretary Clinton was joined by under secretaries for environment, Robert Hormats; global affairs, Maria Otero; and public diplomacy Tara Sonenshine, as well as USAID Deputy Administrator Donald Steinberg and senior officials from the departments of Interior and Justice and among other U.S. government agencies. Steinberg made three new program announcements. First, USAID will partner with the International Union for the Conservation of Nature, IUCN, and the wildlife traffic monitoring organization TRAFFIC. The new initiative is titled Wildlife Trafficking Response, Assessment, and Priority Setting, or Wildlife TRAPS, and will focus on trans-regional trafficking. Second, USAID will join the Global Partnership for Oceans, a World-Bank-led trilateral partnership with over 100 public, private, and civil society partners. Third, USAID will develop a Technology Challenge on Wildlife Trafficking, engaging the best and brightest scientists and entrepreneurs to use technological solutions to combat wildlife trafficking. Crawford Allan, director of TRAFFIC in North America, told the gathering of the “alarming” recent rise in rhino and elephant poaching to record levels in Africa, mainly to meet demand for horn and ivory in Asia. “The unprecedented surge in wildlife crime reflects a fundamental shift in the structure and operation of the illegal wildlife trade over the past decade,” said Allan. Dr. Cristián Samper, president and CEO of the New York-based Wildlife Conservation Society, moderated a panel at the State Department event. “Illegal trade in wildlife, timber and fisheries is estimated to be fueling illicit economies around the world at approximately $10-15 billion annually,” said Samper. “Wildlife trafficking is among the world’s most lucrative illicit economies, second only to illegal drugs and human trafficking. 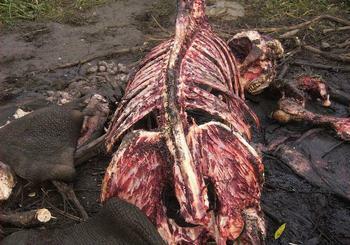 “This year alone, 30,000 African elephants will be killed for their ivory. In February of 2012 alone more than half of the elephants in one national park in northern Cameroon were slaughtered by armed militants from Chad and northern Sudan. African ecosystems are being disrupted, and tourism, a major source of national revenue, is being undercut,” said Samper, who detialing the grim statistics. “It is estimated that 448 rhinos were poached last year in South Africa alone, and rhino poaching has extirpated two African subspecies over the last decade,” he said.